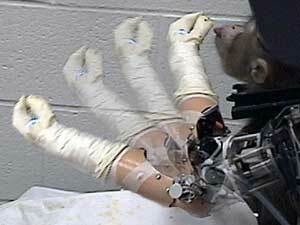 was just watching the Robosapien program on the Science Channel, where they show videos of the experiments that have circulated on the web for several years of monkeys and people controlling devices through electrodes planted in their brains. They point out, correctly, that the potential for these kinds of things to help the disabled could open up a whole new world. But I'm also thinking, after watching the monkey control the arm to eat fruit, that it would be cool to give that monkey access to speech synthesis and open up a gigantic new book on inter-species communication. Down the line the monkeys could sue the pants off us in court for hooking up the electrodes in the first place, which would bring dramatic court TV up to new standards. Don't get me wrong, I'm also all for augmenting the realms of (post-)human experiences and hope they get somewhere in this field while I still exist.